Also, Crosby and Nash are tonight's musical guest on Late Night with David Letterman. 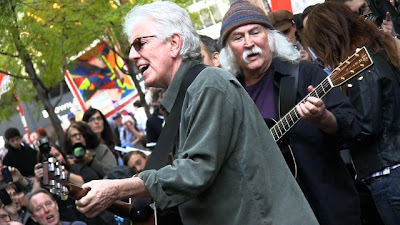 From "Remember That Night - Live at Royal Albert Hall"
Inspired by their recent visit to the park last week, ‘60s rock icons David Crosby and Graham Nash will play an acoustic set at the Liberty Plaza (Zucotti Park) Tuesday afternoon for Occupy Wall Street, according to a spokesman for the protesters and a publicist for the musical duo. While Stephen Stills is touring with Crosby, Stills and Nash — a band long-known for political activism — he wasn’t expected at the performance today. Their gig is planned for 3 p.m. near the corner of Cedar St. and Broadway, according to an Occupy Wall Street spokesman. The publicist for the band, which played the Beacon Theater Monday night, confirmed the show, but wouldn’t divulge other details.